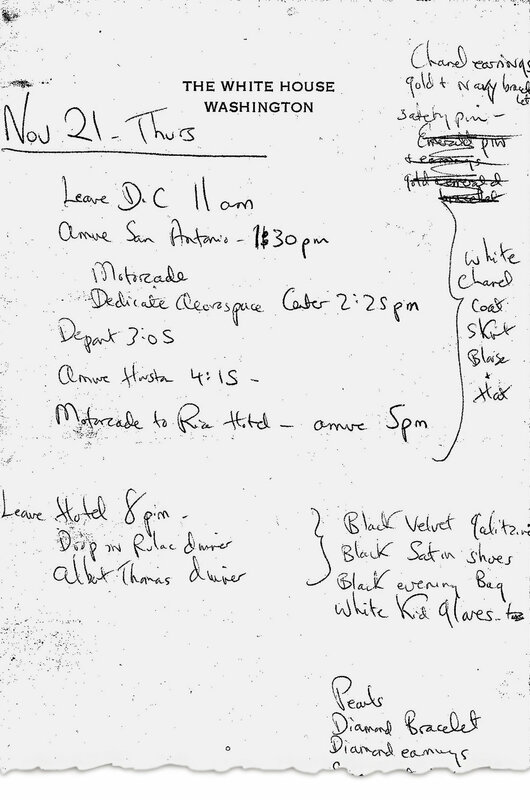 I had a mix of complex, lingering feelings after reading a piece in The New York Times a few days ago about Jackie Kennedy's handwritten notes detailing what she'd wear on a short trip to Texas. Certainly, there was the shroud of fate and of tragedy; the sense of knowing how the plot ends before the character does. But also, there was something remarkably light—something innocent and joyful— about one of the world's chicest women making a simple list of what to wear for a few days away. In the details. Image courtesy Gil Wells via The New York Times. Mrs. Kennedy arriving in San Antonio wearing the white Chanel coat and skirt. Image: Art Rickerby/Time & Life Pictures, via Getty. In San Antonio Texas on Thursday, November, 21, 1963. Image: unknown. I appreciate it when circumstance offers a view into the modus operandi of the ineffably chic women of the world. It's intriguing to pull back a persona, one that is often built using clothes, to look at the woman behind the image. This was one such instance. An outfit to be worn for a day in Dallas. Image courtesy Gil Wells via The New York Times. The pink and navy suit, worn on the day of JFK's assassination. Image: Getty. I write about Jackie Kennedy frequently enough (her friendship with Diana Vreeland, her Cape Cod style, her and Lee in summer), but only now did I get some insight into why I find her such a compelling figure for me personally, much beyond the icon status. It feels to me that Jackie Kennedy is a woman who understood the power of fashion, the currency of clothes. I think she saw key moments of her husband's Presidency in terms of fashion, and intuited that clothes could be a critical part of the administration's messaging, which, of course, they are. And yet, while it's clear pieces of her image were carefully calibrated, in the execution of her looks there is an effortlessness. And maybe it's this above all that I find intriguing about these jots of hers on paper. For a woman who always made it look so easy, there was still planning and consideration that went on behind the scenes. I appreciate knowing that, and feeling it. So often as women we falsely perceive that effortlessness is really just that. In fact, here's some evidence to the contrary: maybe a sense of effortlessness stems from some amount of effort invested. If so, maybe we give ourselves generous latitude to invest time and attention in matters of appearance. Maybe these pursuits aren't necessarily superficial; not skin deep. Instead, maybe in these quiet moments orchestrating our image, a sense of our self arises. The woman we are. And the one we are slowly becoming. Feature image: Jackie Kennedy and JFK in Dallas on November 22, 1963. Cecil Stoughton/The White House via John F. Kennedy Presidential Library.